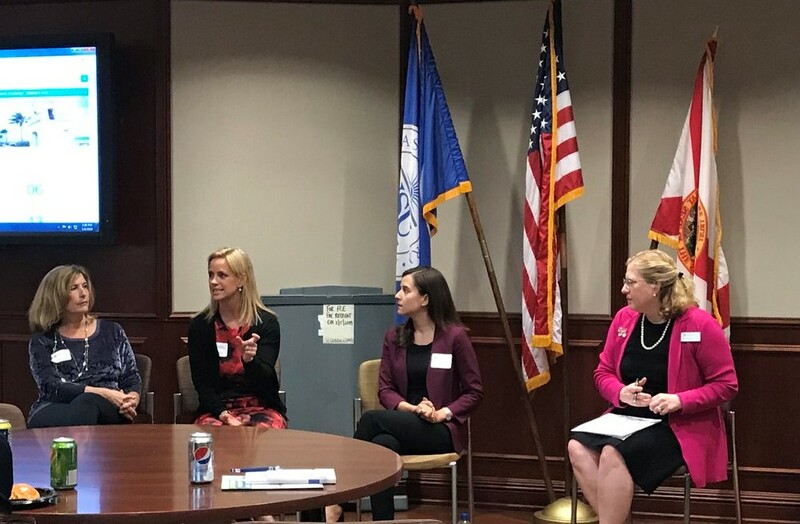 Thanks to the CFA Society of South Florida for inviting Mari to participate in the February 6 panel on “Women in Finance” at the Huizenga School of Business at Nova Southeastern University. The event was open to CFAs (Chartered Financial Analysts), students and professionals exploring career changes. It was a great opportunity to spread the word about the wide range of rewarding career paths available to women in all areas of the financial profession! Fellow panelists included Lenore Reiner, VP and Responsible Investment Strategy Specialist at Calvert/Eaton Vance, and Gabriela Santos, Executive Director and Global Market Strategist at J.P. Morgan Asset Management. The panel was moderated by Christina Worley, CPA, CFP, CFA, Managing Member at Castle Wealth Management in West Palm Beach. We had a lot of fun and enjoyed sharing stories about how we got into our respective careers, why we need to attract more women to finance (for example, the percentage of women CFPs is still stuck at 23% after more than two decades), how to work with mentors (and mentees), and what skills and credentials pave the way to successful careers in finance. The main message: We all love what we do and hope to encourage more women to give finance a try!